With summer almost here, homeowners everywhere are getting ready for backyard barbeques and outdoor entertaining. If your patio is closer to purgatory than paradise, read on for some easy DIY ideas to improve the look of your patio and get your lawn in shape for summer. If you don’t have a patio in your yard, start by determining where you want it to be. A patio doesn’t have to be right next to the house, it can be in a secluded corner of the yard instead. Regardless of where you decide to put it, patio pavers, such as those from Pavestone, make it easy to create an entire outdoor space. We created this outdoor living area using multiple sizes of pavers. To build a paver patio, mark out the area, remove the existing topsoil, and add a 3” thick base of crushed limestone topped by an inch of sand. Make sure the base is flat with a slight slope away from the house for drainage. 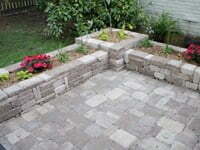 Next, lay the various sizes of pavers in either a specific design or a random pattern. You can even construct beautiful planter boxes and an outdoor fireplace or fire pit by stacking patio pavers held together with landscape adhesive. Building an outdoor fireplace may look intimidating, but Pavestone provides detailed plans to get the job done. If you have an existing, bland concrete slab patio in your backyard, there are several ways to improve the look, including scoring and staining, and applying a new surface. No matter which approach you decide upon, start by using a pressure washer to thoroughly clean the concrete, then allow it to dry. 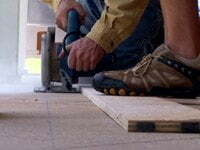 To score decorative grooves in a concrete patio, use a chalk line to layout the pattern desired on the floor. Cut 1/8” deep grooves in the slab with a circular saw equipped with a diamond tipped masonry blade, using a piece of plywood or a straight board as a straight edge to guide the saw. Always wear an approved dust mask or respirator when cutting concrete. Once the grooves have been cut ant the dust removed, apply either a translucent or solid concrete stain to the surface with a roller. You can also give a concrete patio a brand new look by installing porcelain tile or natural stone on top of the concrete. Start by applying a crack isolation solution, such as RedGard from Custom Building Products, to the concrete to prevent the transmission of cracks to the new surface. Next, choose whatever surface you like—including tile, stone, or brick—and use a polymer modified mortar to adhere the material to the slab. After the mortar has set for 24 hours, fill the spaces between the tile or stone with quality grout, such as Fusion Pro grout or Natural Stone & Tile Mortar from Custom Building Products. Finally, seal the surface with Aqua Mix Enrich & Seal from Custom Building Products to ensure the patio keeps looking good for years to come. 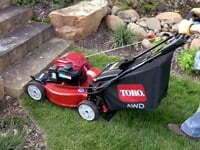 Keeping your lawn looking good starts with a quality lawn mower, such as the 22” Recycler All-Wheel Drive Personal Pace mower from Toro. All-Wheel Drive ensures great traction in tough mowing conditions, and the Personal Pace feature on the Toro mower senses and smoothly adjusts to your preferred walking pace. The recycler cutting system cuts the clippings into a fine mulch that feeds your lawn and eliminates bagging. The mower also includes a Bag-On-Demand feature, which offers a quick-change lever for switching from mulching to bagging in seconds. The Briggs & Stratton ReadyStart™ engine on the Toro Recycler mower eliminates the need for choking and priming and features “Just Check and Add” so you never have to completely replace the oil. Whether you build a paver patio, stain and score an existing concrete patio, or added a new surface to a concrete slab, your new outdoor living space will make the perfect retreat for your family this summer. Watch our video on Tips for Making a Backyard Patio Paradise to find out more.